County Road 7 bisects Pickwick, Minnesota, before reaching a “T” at Little Trout Valley Road and Lake La Belle. Pickwick, named for an early Charles Dickens novel, feels quaint, lingering in the past. Holsteins graze on a front lawn. A father and his sons mend a barbed-wire fence running out of a red barn. There’s even a 19th-century gristmill sitting adjacent to a stream. Jane sits at the base of the four-story mill, volunteering her Saturday to meet any visitors who may stop off. When asked if Sanborn Canoe Company is nearby, she says she’s never heard of it. But she does have a suggestion for the entrepreneurs. “They should take their company onto that Sharks reality show,” she says, referring to Shark Tank, the reality show where aspiring entrepreneur-contestants make business presentations to a panel of “shark” investors. A softball’s throw away from Jane, Todd Randall is working in his shop, Sanborn Paddle’s headquarters. Based on the looks of the place, the company doesn’t appear to need the assistance of investors at this point. 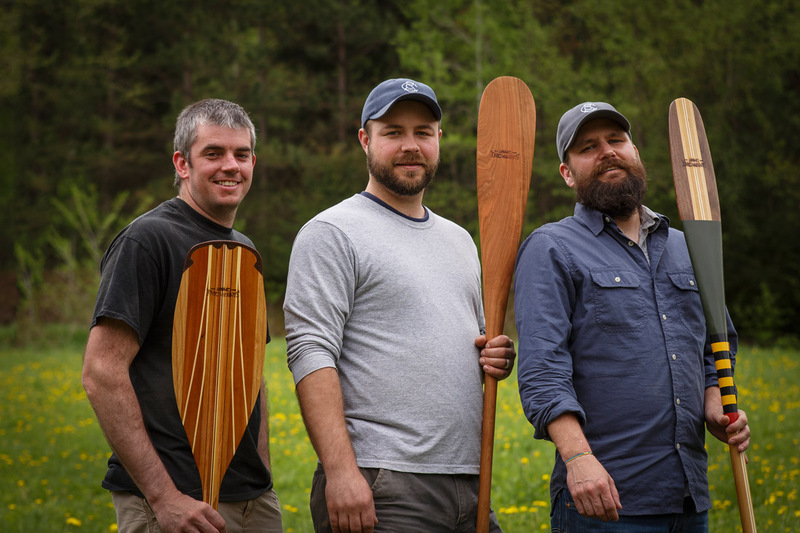 Todd and his cousin Zak Fellman co-founded the now-booming Sanborn in 2009, banking their futures on handcrafted canoe paddles and outfitters’ goods. And they seem to be doing just fine. Sanborn may lack name recognition in Pickwick, but they’re well-known elsewhere in the state—and nation. 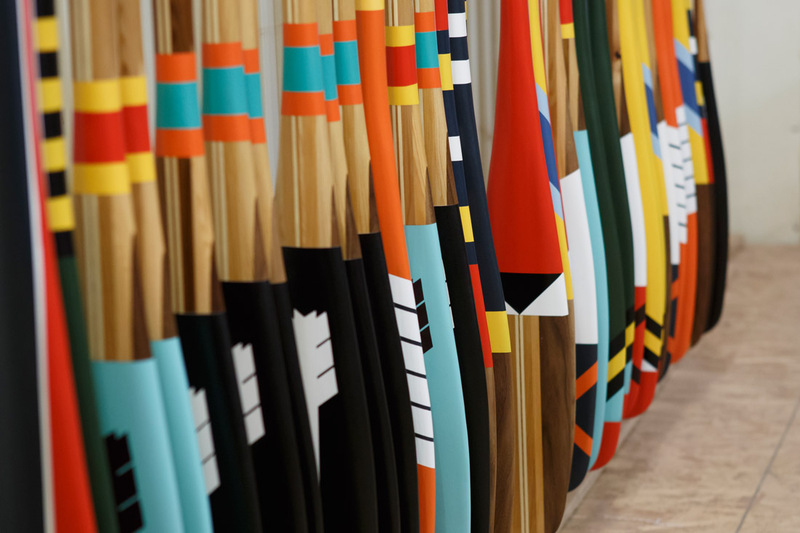 Minneapolis-based retailers Midwest Mountaineering and Askov Finlayson carry the gorgeous, sturdy, one-of-a-kind paddles. When Sanborn used reclaimed Jack Daniels whiskey barrels for a custom-run of paddles, “Outside Magazine” gave them an impressive shout-out. Orders are placed from as far away as Europe, Australia, and Japan. Moreover, Todd and Zak’s homespun touch—knowing customers by name, swapping products with other small start-up outfitters like Wood&Faulk, an independent Portland manufacturer who crafted Sanborn’s new line of backpacks—makes Sanborn a household name within the heritage-inspired clothes and goods movement. When I arrive at the shop, Todd is wearing a green baseball cap covered in sawdust. 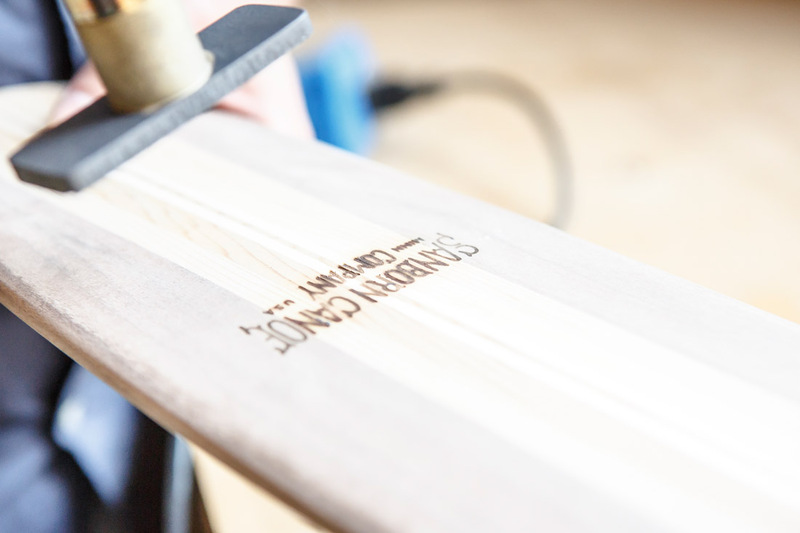 He runs a small branding stick through a flame, and then presses it into the paddle’s handle. He speaks softly and deliberately, like the pastor he initially studied to be. That same blend of new and old reads true for Sanborn. Hidden amidst the hardwood-topped coulees of southeastern Minnesota, Sanborn espouses an enchanting timelessness, from their products to their workmanship to their shop, mixing old-school woodworking with the branding of a sleek, easily-navigable website and social-media savvy (they have over 16,000 followers on Instagram). Achieving this unique balance is a group effort: Zak, Todd’s elder by a couple years, runs the company’s art department, designing and painting the patterns on the paddles and managing the website. Todd stays in the woodshop, fiddling with their grandfather’s joiner. “I don’t think Zak’s physically made a paddle in years,” Todd laughs. But he points out that each of their talents are necessary for Sanborn to thrive. Sanborn grew from a family tradition of canoeing in the Boundary Waters, crossing misty lakes at dawn and frying walleye on rocky beaches. It’s an experience the men cherished—and were inspired by. In 2009, the cousins had time on their hands. Zak, a Winona-area native, was a stay-at-home dad. Todd, from up the road in Plainview, substitute taught and worked overnights at a group home. Motivated by memories of childhood backcountry adventures and their woodworking grandfather—whose barrel-brown canoe he made with friends in the 1960s is suspended on a wall in the shop—Todd and Zak bought a how-to book on canoe building, curious to see if they had what it took to follow in their grandfather’s footsteps. Their first prototype—a long, bowed, cedar-strip torpedo—sits stripped of paint outside the shop. Making a canoe, Todd claims, wasn’t so difficult. “It’s just heat and moisture,” he says of the notorious “bending” technique by which canoe makers achieve rotund, watertight-bellied ships. The do-it-yourself ethic of that first project kindled something in the guys, and they sought to complete the job with handmade paddles. That’s when they ran into a problem. “There weren’t a lot of how-to [guides] on paddles,” Todd says. So they studied designs online. Consciously avoiding stealing from others, the cousins made a few paddles, then a few more, and suddenly they were working part-time. Their big break came when they landed a partnership with Trailfitters, an iconic Duluth outfitter. Since day one, the bottom line for Sanborn products has been quality. 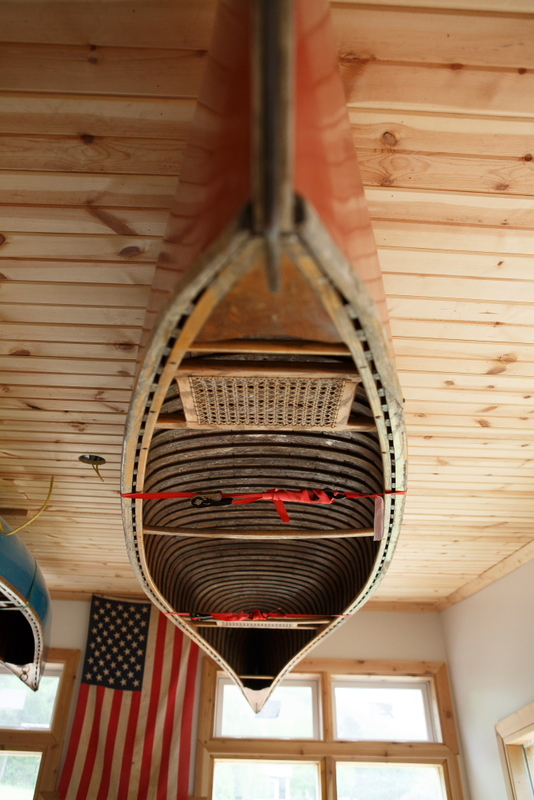 “Back in the old days when we’d go paddling up north, we used these cheap wooden paddles from Fleet Farm,” Todd says. “They were old and weathered, grey and warped, the varnish had worn off—one was held together by duct-tape.” They wanted to do better. Christopher Vondracek lived and taught in Winona, Minnesota, for years before relocating this spring to Minneapolis. He is working on a memoir about Lawrence Welk and pursuing an MFA at Hamline University.